Silvia Dominguez, an interdisciplinary scholar who researches the welfare of women, children and minority populations, offers the talk Getting Ahead: Social Mobility, Public Housing and Immigrant Networks at 4:15 p.m. Thursday, May 9, in Room G52, Pettengill Hall, 4 Andrews Road (Alumni Walk). The lecture concludes the series City, Neighborhood and Society: Social Science Approaches to Urban Issues. This series has been sponsored by the Department of Sociology with support from the Program in Environmental Studies, the Division of the Social Sciences, the Office of Intercultural Education and the Office of the Special Assistant to the President for Diversity and Inclusion. Additional support for specific speakers in the series has been provided by the Harward Center for Community Partnerships, the departments of politics, anthropology and history, the Program in Women and Gender Studies, and OUTFront. For more information, please call 207-786-8296. 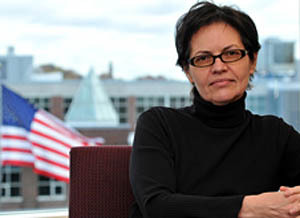 Dominguez is an associate professor in the department of sociology and human services at Northeastern University. She is also a faculty fellow at the Urban Health Research Institute, the Gender and Sexuality Program and the Brudnick Center for the Study of Conflict and Violence at Northeastern. A forensically trained psychotherapist, Dominguez is affiliated with Massachusetts General Hospital’s Division on Global Psychiatry. She helped developed the 2009 National Mental Health Policy for the Republic of Liberia. A Ford Foundation and Woodrow Wilson fellow, she chairs the Latino Section of the American Sociological Association and has been recognized by the United States Census Bureau as an ethnography expert on low-income populations. She holds degrees in sociology, psychology, forensic social work and social welfare policy.